Tai Viet Corporation (Vietstock), Vietstock.vn, is estabished 2001, fully aware the vital importance of information, determined to provide investors with comprehensive information on Vietnam, Laos and Cambodia financial and equities market. 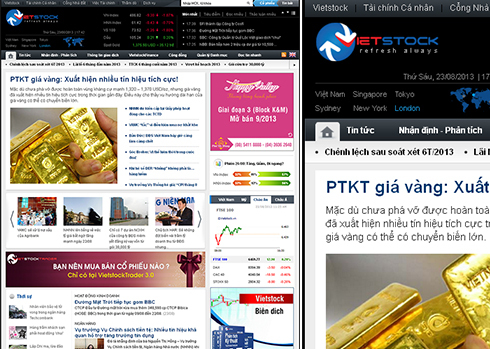 Vietstock also desired to become investors’ companion in making sound investment decision. Vietstock is the pioneer in providing information services on Vietnam financial and securities market. In conjunction with the Vietnamese equities market, Vietstock has achieved gradual improvements and earned a well-deserved trademark and reputation over the last 10 years to become Vietnam’s leading information portal on finance and securities. Vietstock serves as an indispensable bridge between listed and unlisted public companies, securities companies, other financial institutions and the investment community. By the end of 2013, the Vietstock community forum has more than 140,000 members. Be aware of the potentiality of new securities markets of Laos and Cambodia, Vietstock is the pioneer in providing information as well as consulting the procedures to open accounts and trade in Laos and Cambodia securities market. Vietstock is also the unique distributor of MetaStock technical analysis software in Vietnam. Other products include VietstockUpdater, an app to provide data for technical analysis software such as MetaStock, AmiBroker,…; VietstockMobile, a leading financial mobile app; VietstockTrader, a terminal client app; and VietstockFinance, a financial information and investment analyst portal.